An education at Gateway School in Leicester (1966-73) laid the foundation for Ian’s work today. His Quaker headmaster encouraged a keen interest in all things creative. This led to a coveted place on a four-year fine arts course specialising in silversmithing and jewellery at the iconic Sir John Cass School of Art in Whitechapel, London (1973–77). Whilst at Cass, the Whitechapel Art Gallery nearby provided part-time employment under Nicholas Serota, and introduced Ian to the world of fine art, in particular British Minimalism. Harrold worked first as a Production Manager for Cartier in Bond Street and as a silversmith, successfully creating and selling his own work in the 80’s, exhibiting with the Goldsmiths Company and Electrum Gallery. He also became instrumental in developing the technology for and introducing video graphics to the world of marketing, forming his own broadcast graphics company and enjoying a long career producing work for all the major UK television channels. Harrold’s qualifications include a DipAd, City and Guilds Higher Diplomas in diamond mounting and gemology and a design award from the Royal Society of Arts. 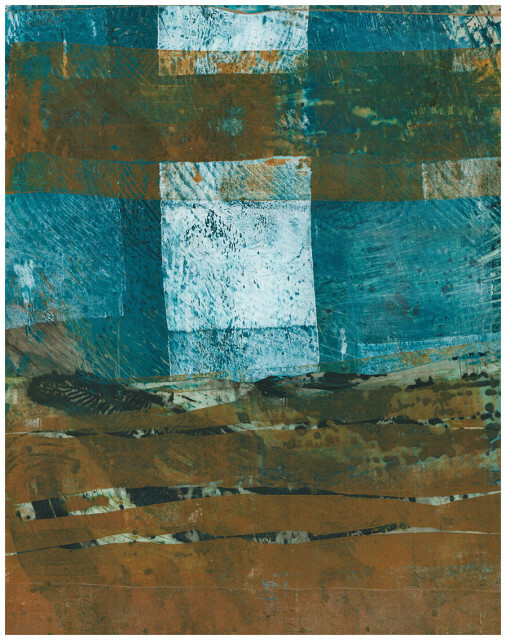 A move to North Cornwall in 2014 enabled Harrold to begin an intensive period of collagraph and etching printmaking, often working in St Ives. Soon he was drawn back to working in oils, on gessoed board, providing a robust base for the techniques he uses. Harrold creates all his earth coloured paints from raw earth powder pigments acquired in London in the 70’s. These hand-made paints are then mixed and layered with other oils in varying consistencies. As layers dry, they are partially removed using a variety of methods to work back through the layers – including applying pressure to the surface, effectively pushing the top layers back through the work, visually disrupting the order of the layers of paint. Works can be inspired by distant memories of time and place or the simple fluidity of a shape quickly drawn in wet sand on a Cornish or Breton beach. Spring Exhibitions, Limekiln Gallery, Calstock, 2015 & 2016.